Also known as “artificial dental root therapy” when translated from Japanese. The tooth consists of the crown and the root. If decay and damage spread up to the root without action, the tooth will require extraction. We select only the most reliable of treatment systems for our patients. Our clinic only uses implant products manufactured by reputable manufacturers and developers with the highest market share in the industry. [Nobel Biocare Company] Global market leader. Nobel Biocare’s headquarters is in Sweden and they are a pioneer in modern implant system innovation. The system has over 40 years of high level clinical application experience. 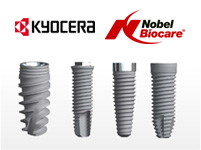 [KYOCERA Medical Company] Japan’s long time market leader in implant technology. They began selling dental implants in Japan from 1978 and is a fixture in the history of Japan’s dental history. They remain Japan’s most prominent and reputable domestic manufacturer. [BBC company] We actively collaborate with clinical physicians to fine-tune and sharpen the accuracy of our technology based on the laws of probability. This is an organization authorized by the FDA, USA’s governing body for Food, Drug and health related products. Our clinic utilizes the Galileos of Sirona’s CT technology which can be used for both low exposure imagery and high quality, detailed scans. 3D image data taken by our clinic’s CT technology is absolutely indispensable for treatment as an accurate diagnosis ultimately determines the severity of patient’s condition and exactly what kind of treatment plan they will undergo. We chose Germany’s Sirona Co. because they are a prominent, highly respected medical device manufacturer that we trust and in turn will help patients feel secure. It goes without saying that thorough sterilization is of paramount importance to ensure infection isn’t caused by treatment tools and equipment. “Bacque Clave 31B+ cleared the stringent class B classification of European medical standards imposed in the countries with the most advanced dental industries. The technology uses repetitive, high pressure vacuum and steam sterilization. It enables flawless and thorough sterilization of all equipment that most clinics in Japan cannot match. Since our opening of clinic in 2012, our hospital achieved 8,600 implant placement for 4,500 cases. Now we have hundreds of implant surgery every year and we have expert skills and experience In our hospital, treatment will be carried out using the latest equipments under safe environment.